Natalia Lafourcade (born Natalia Lafourcade Silva on 26 February 1984 in Mexico City, Mexico) is a Mexican pop singer and songwriter. In 2005 she released Casa, her second CD, but this time as Natalia y La Forquetina (the name of her band). Since she was very young, Natalia had a great interest in music, partly because her parents were musicians. At three years old she began to sing and at four, she realized that she wanted to be an artist. Since she was very young, Natalia had a great interest in music, partly because her parents were musicians. At three years old she began to sing and at four, she realized that she wanted to be an artist. She attended Instituto Anglo Espa?ol, a Catholic middle school. In her childhood and adolescence she studied painting, flute, theater, music, acting, piano, guitar, saxophone and singing. When she was 10, Natalia sang in a Mariachi group. She lived many years in Coatepec, Veracruz, Mexico, where she studied music with her mother, imitating artists like Gloria Trevi and Garibaldi. In 1998, Natalia was part of an all-girl trio called Twist. Unfortunately, the group was unsuccessful and they split up the next year. Soon after, she began preparing to be a solo artist. When Natalia was 17, Loris Ceroni gave her the opportunity to be in a pop/rock group under his guidance, but when she wasn't sure, he encouraged her to go solo. 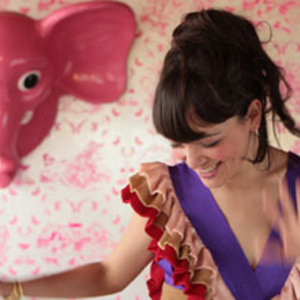 Although LaFourcade didn't join the group, Loris Ceroni produced her first LP under the label of Sony Music. It was recorded in Italy and was cowritten with Aureo Baqueiro. Sabo Romo played in 2 songs. Natalia Lafourcade's music is a mix of pop, rock, bossa-nova and latin rhythms. It features the songs Busca un Problema, Elefantes, Mirame, Mirate and her biggest hit: En el 2000. In 2003, she was nominated for a Latin Grammy in the Best New Artist category (she lost to David Bisbal) for her debut album. Also, she collaborated on the soundtrack of the Mexican movie Amarte Duele. In 2005 she released Casa, her second CD, but this time as Natalia y La Forquetina (the name of her band).